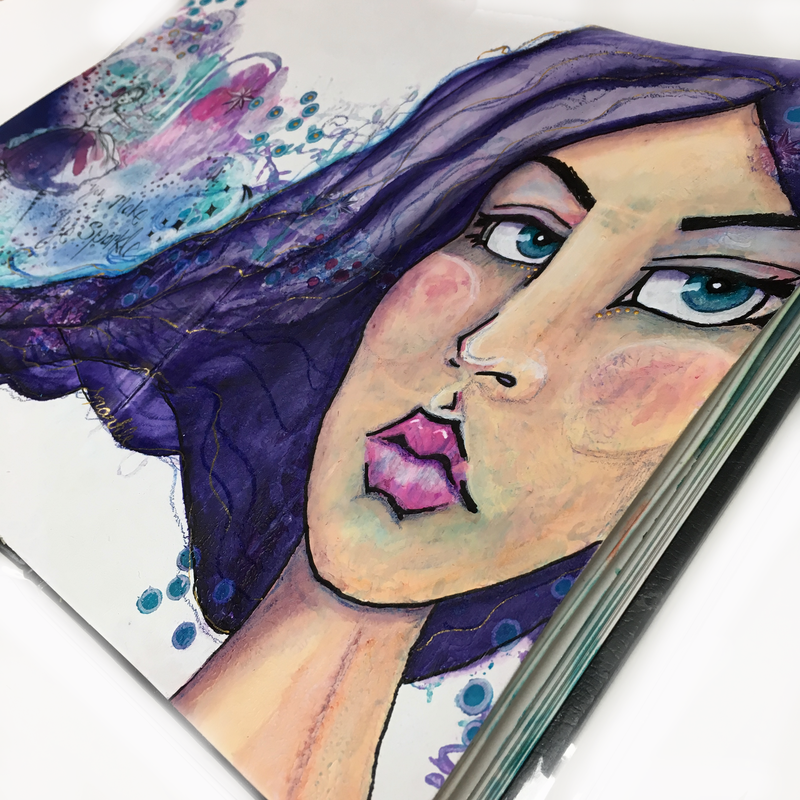 Good morning Lulu Art fans – it’s been a while since I shared here on the blog, so I thought I’d start with a little art journal page with a lot of attitude. 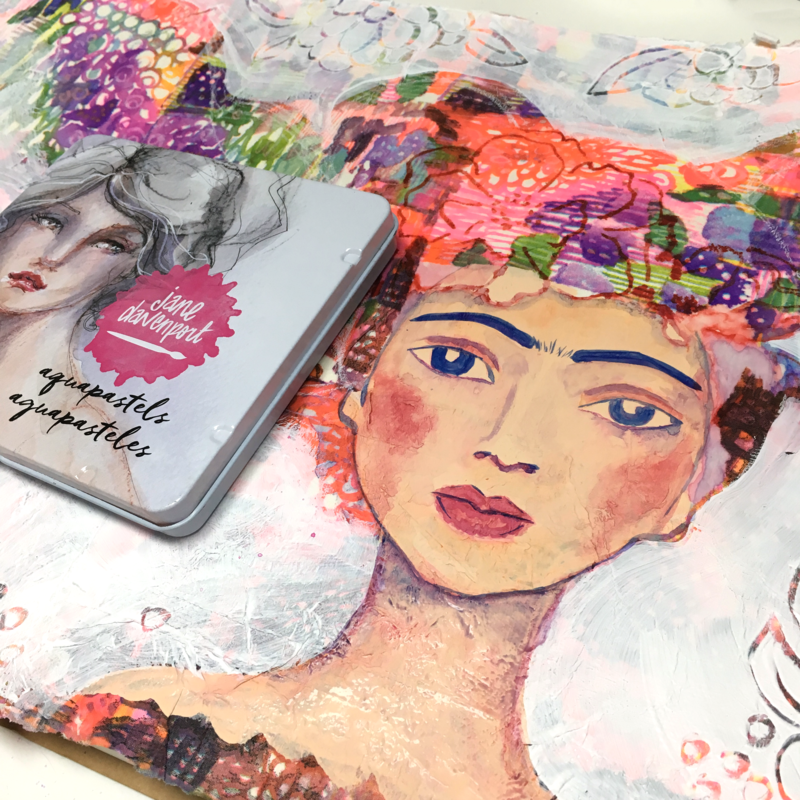 Today we will be creating a page chockfull of Jane Davenport goodies and yummy colors all available from Lulu Art of course. 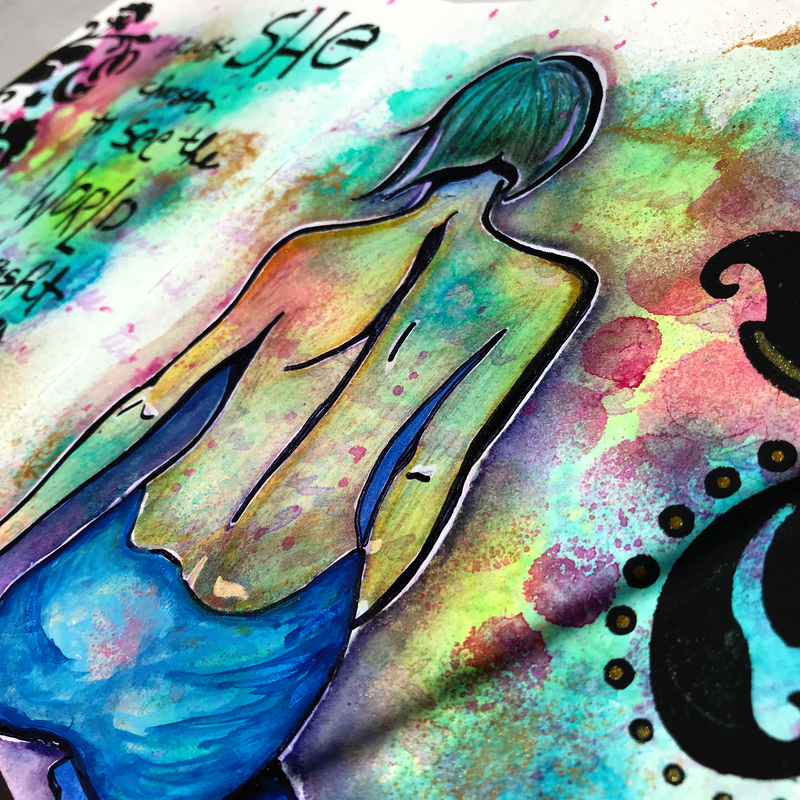 It starts with a freeform background and journal tattoos and finishes with a face fit for a drama queen. This page is nearly impossible to explain in writing (well I could but you might be here for a while!) – so I’ve recorded the process so you can see each step and play along with me. 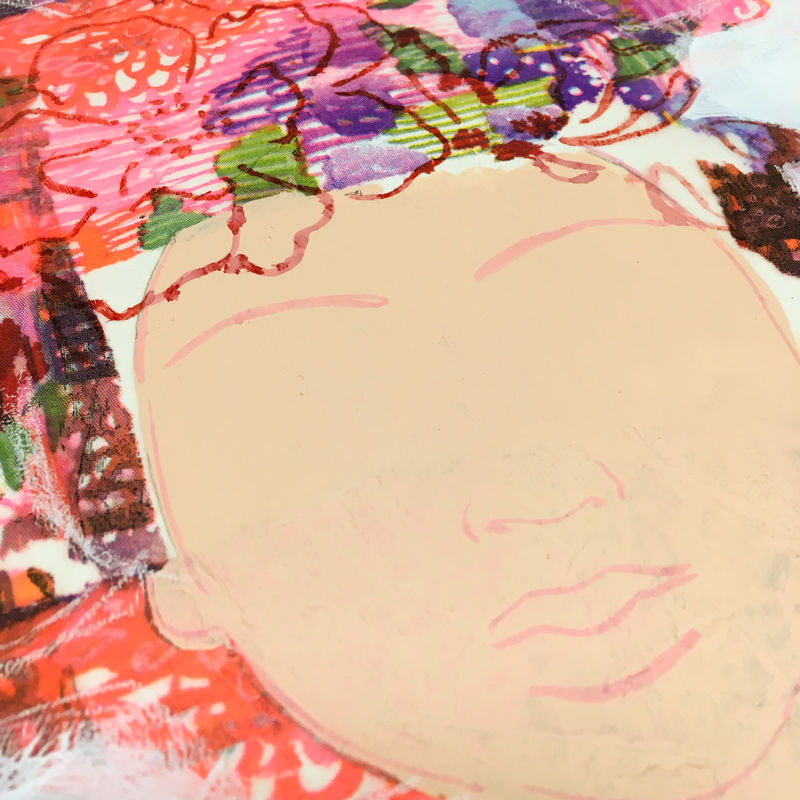 Start by painting the page with gesso then close the page and open again while the gesso is wet to create texture – flatten out any ridges where you intend to add your drawing or face. 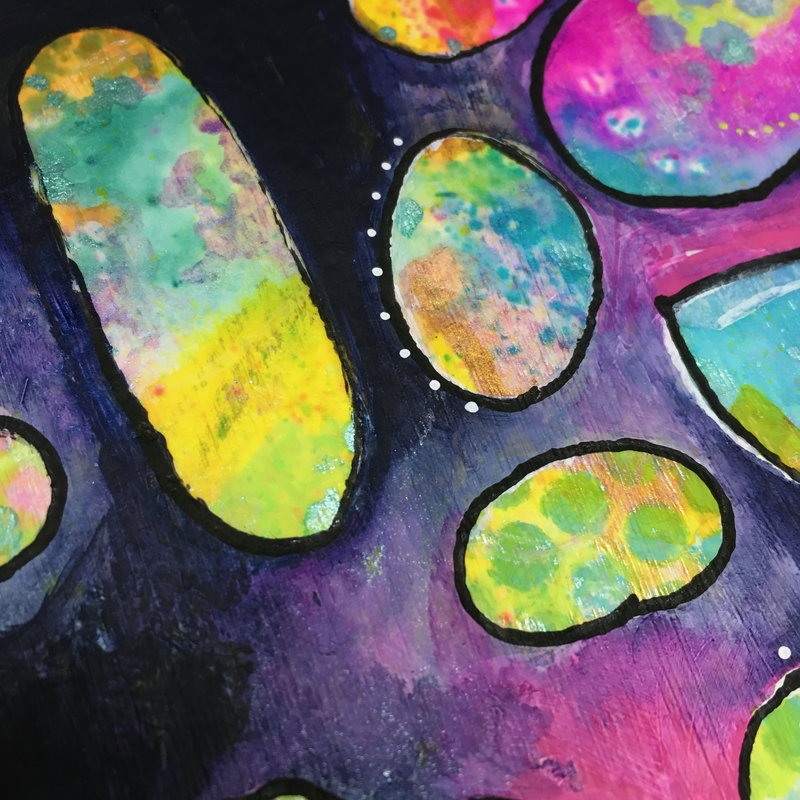 Then, randomly add paint blobs to the page and squish the pages together. 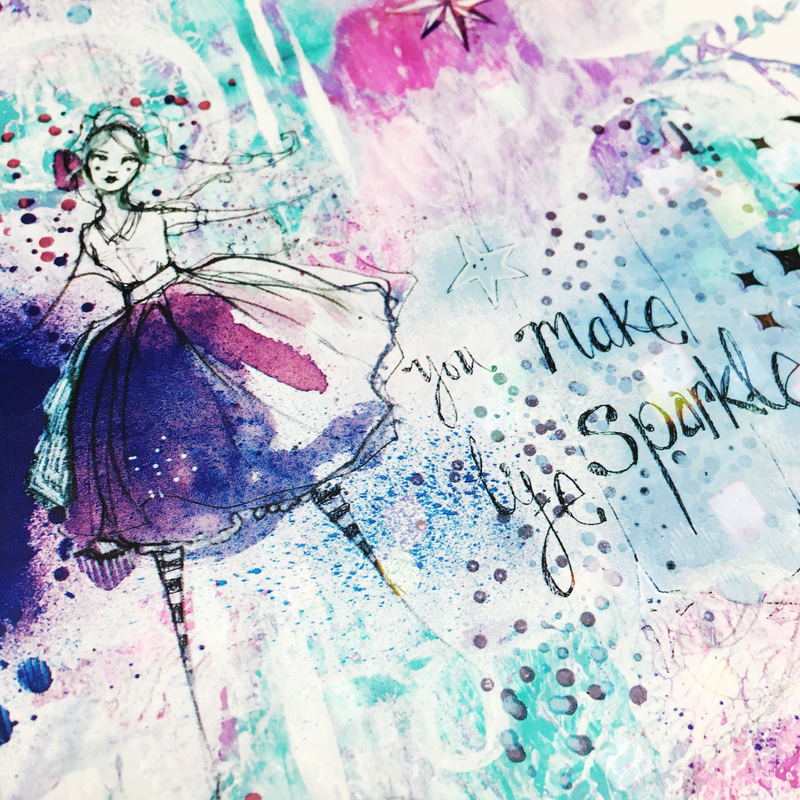 Spread the paint on the journal page and while the paint is wet, add stamping. 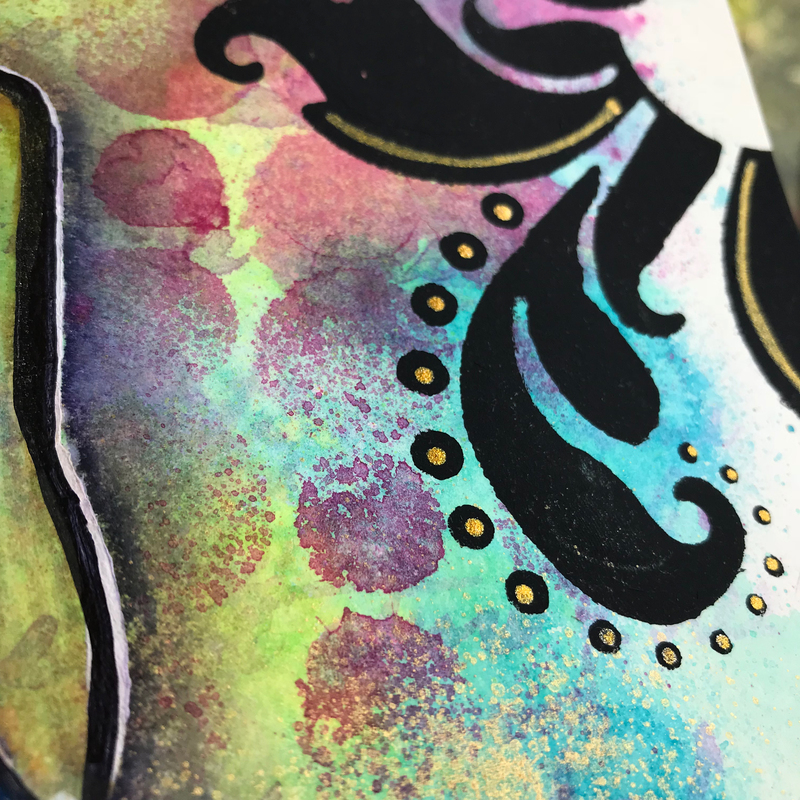 When this layer is dry scrape on gesso and once dry apply journal tattoos onto the background. 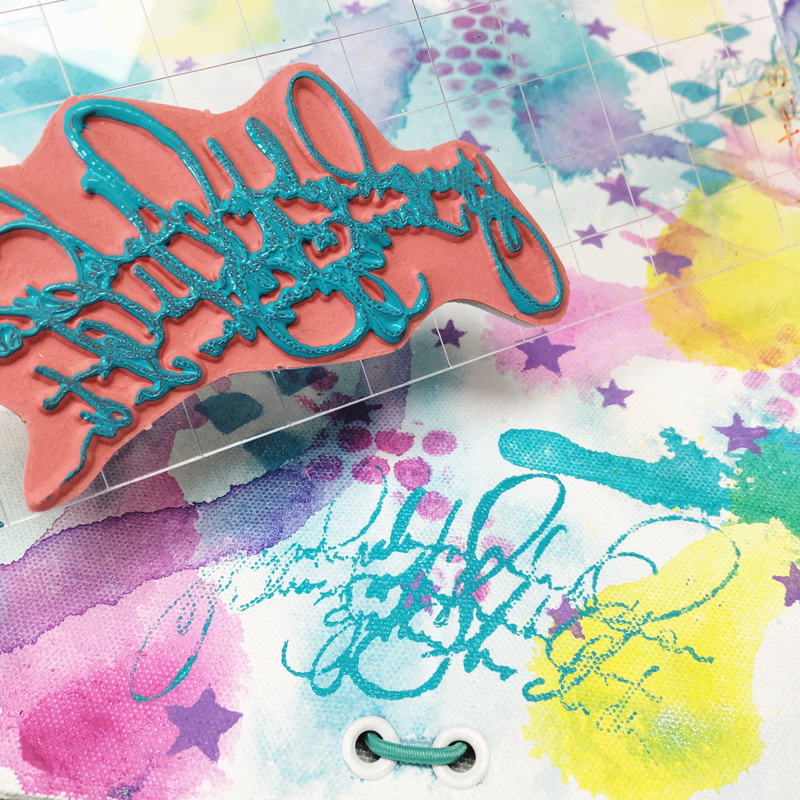 Use a waterproof ink and stamp Jane’s single face stamp onto the page. Add hair using Mermaid markers and add a base layer of acrylic paint onto the face and spread about with a water brush. 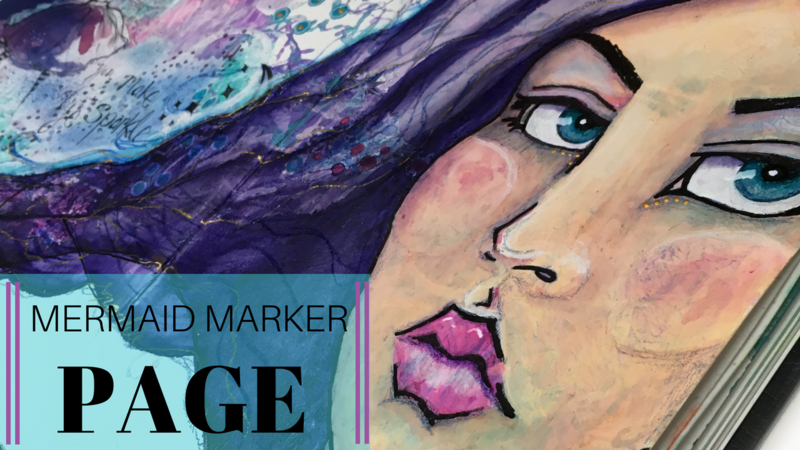 Using paint over pens and mermaid markers to add layers of color to the face and spread color with a water brush to soften colors. Once dry outline face features with Fude Ball pen – ps the Dina Wakley Fude ball pen I used glides over the page (even the textured bits) like butter!!!!! 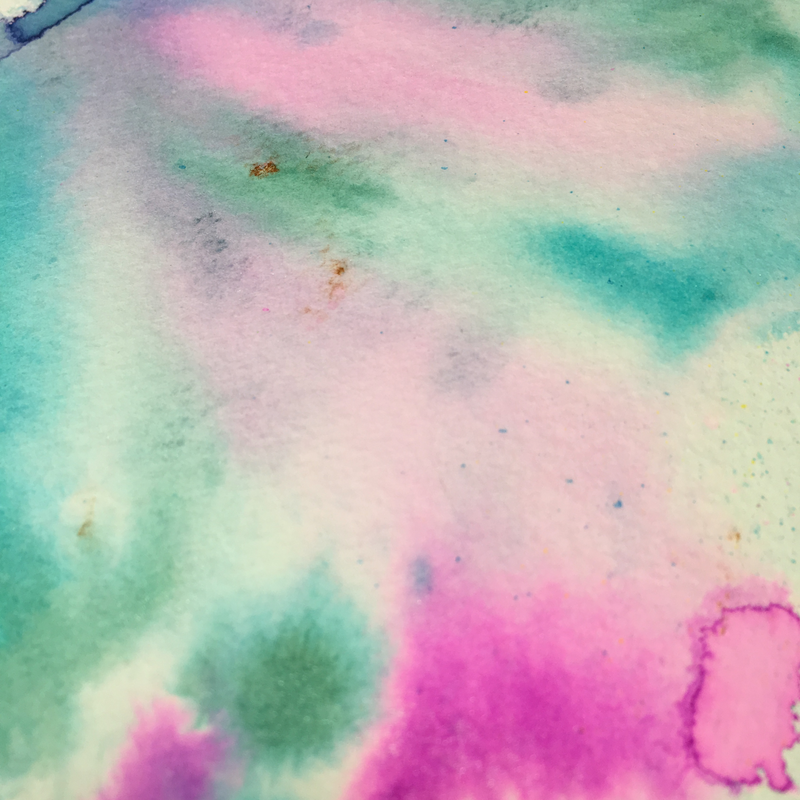 Add layer upon layer of color with Mermaid markers blotting with a paper towel and thinning color with a water brush, building up layers of color until you achieve the look you are after. 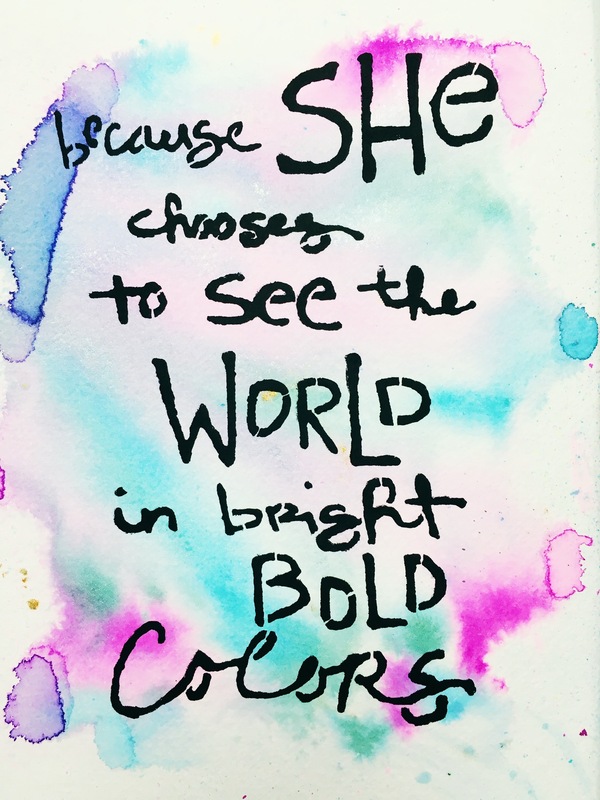 While the color may not be even applied in this way, it sure is pretty! Define and add a final layer of color using Prismacolor pencils. Embellish the hair and background with gold paint to finish the page off. Now it’s your turn, grab those supplies and go make art. 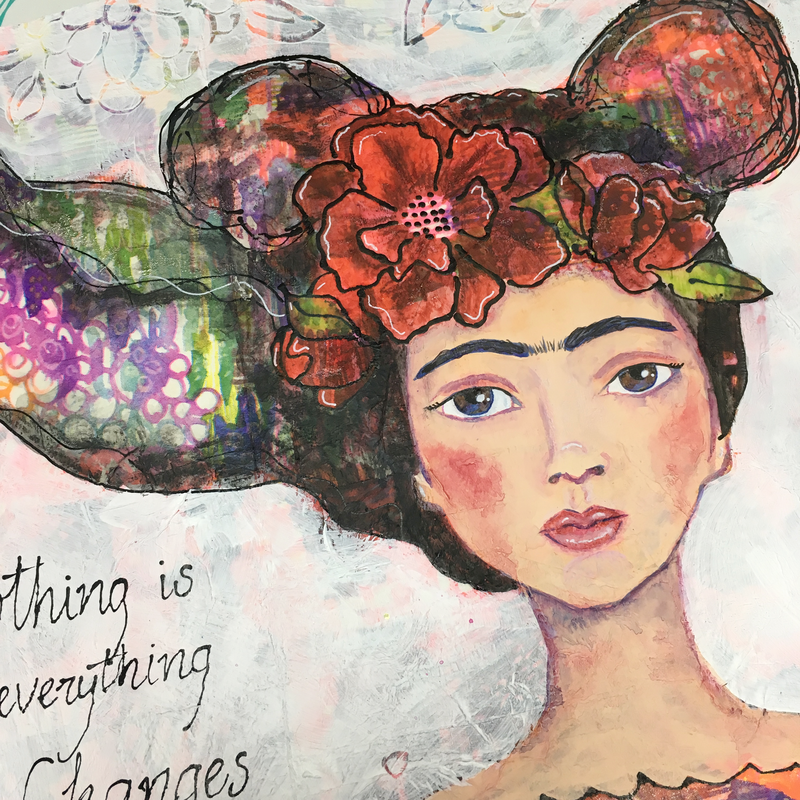 OK how could I resist making an art journal page using Jane Davenport and Kylie Fowler supplies, especially now that Kylie is carrying Jane Davenport supplies in store I kinda HAD to make this page. 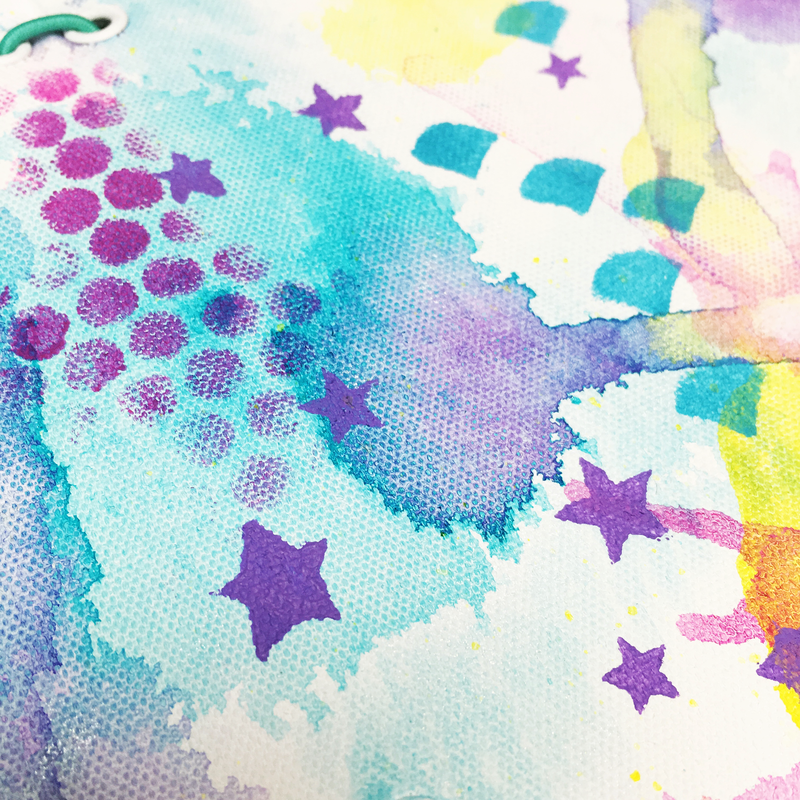 I was inspired by the riot of colours in the new collage papers and felt like I needed to make an equally riotous and wild page. 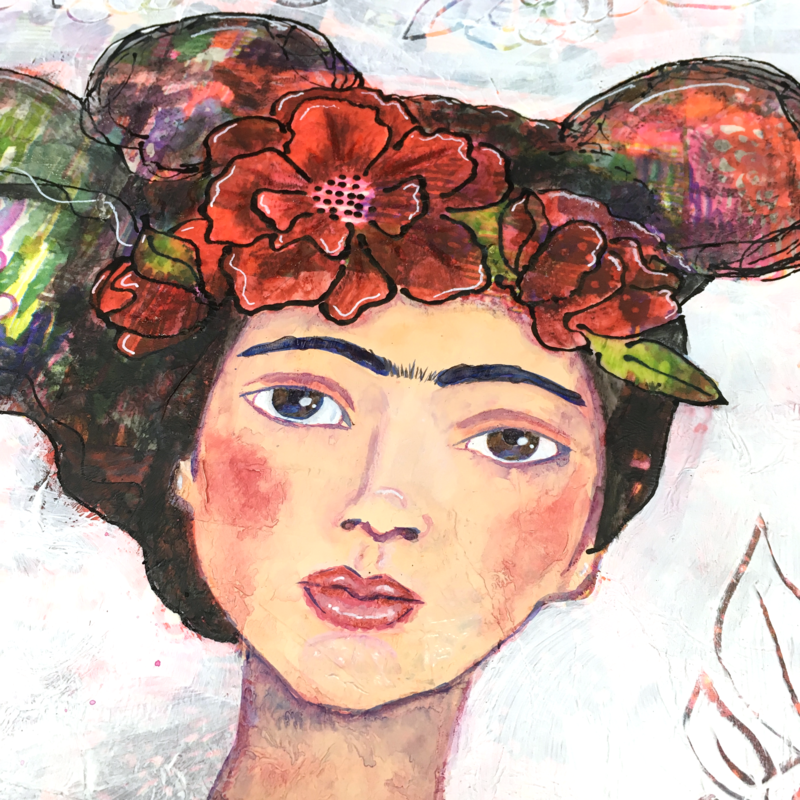 From there it was a short hop to Frida Kahlo as it’s Frida I think of when I think of wild and unrestrained. 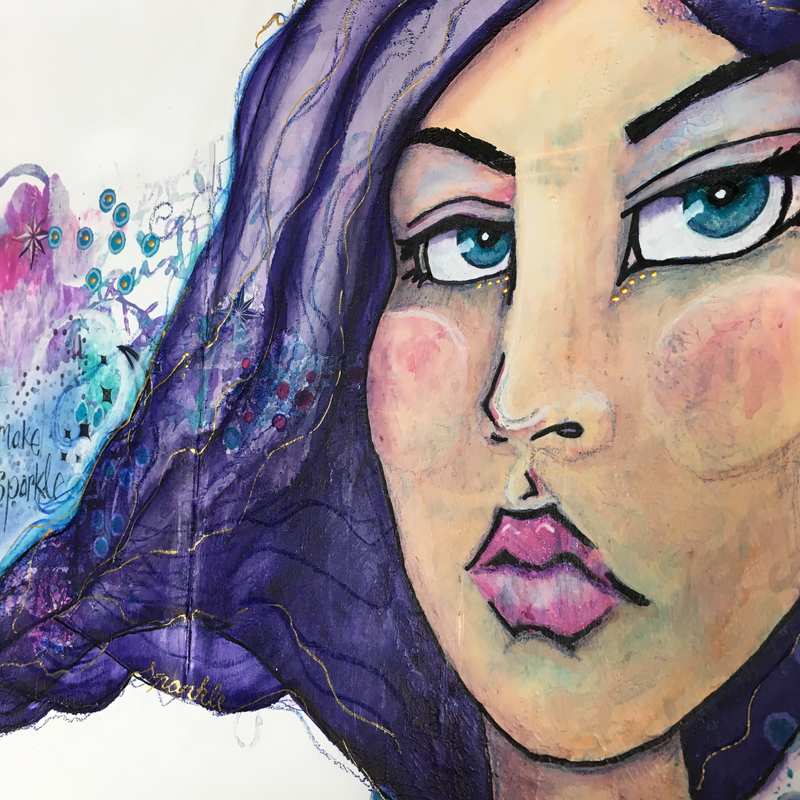 While there are a few steps, all are simple and unrestrained and focus on fun and experimentation – so grab some papers, paint and some water soluble crayons or markers and have a play with me! 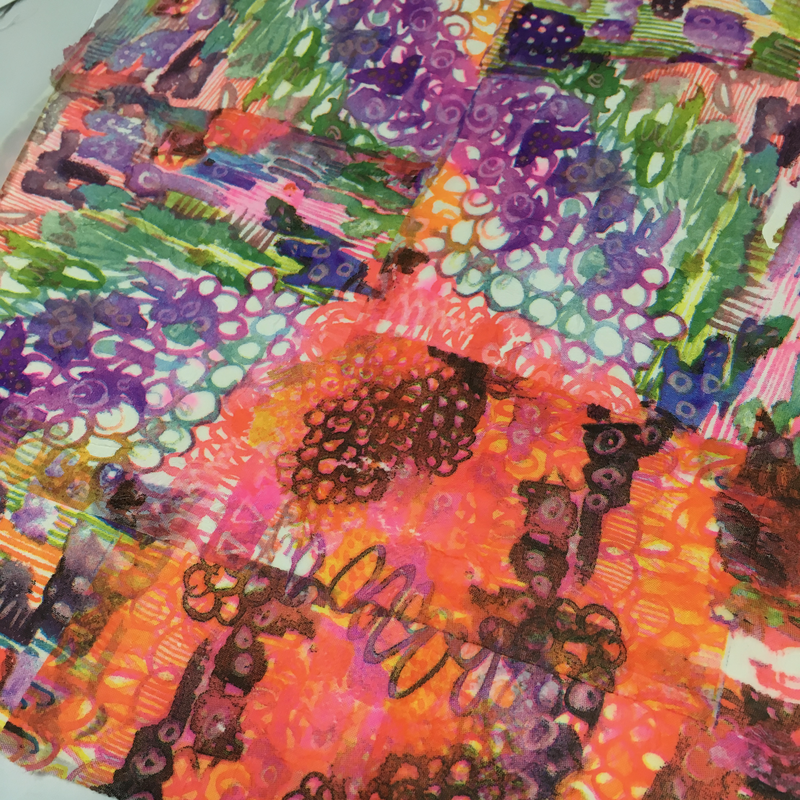 Start by gluing collage papers over your journal pages using mat medium and then allow to dry completely. Now it’s time to create the base layer for your face, use the Peace face stencil from the Fowler face series as an outline and paint in the shape using Ceramcoat Santa’s Flesh. 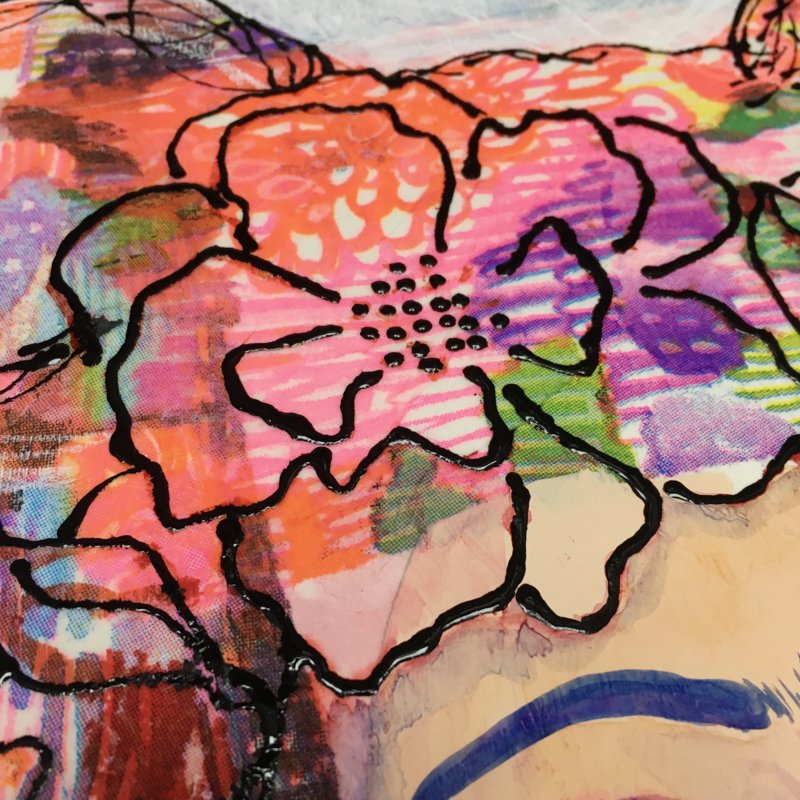 Use a water-soluble marker to sketch in the facial features, and mermaid markers and one of Jane’s stencils to sketch the outline of flowers in the hair. Now it’s time to tone down the page a bit. 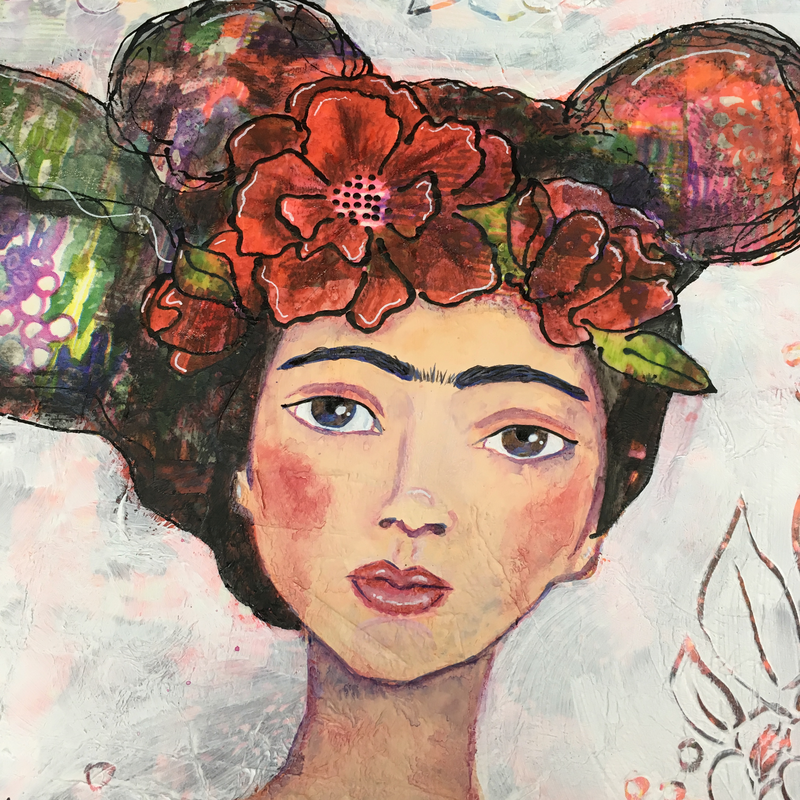 Sketch the outline of Frida’s hair and then paint around the face and hair with gesso – make it as thick or thin as you like to hide or reveal the background details. 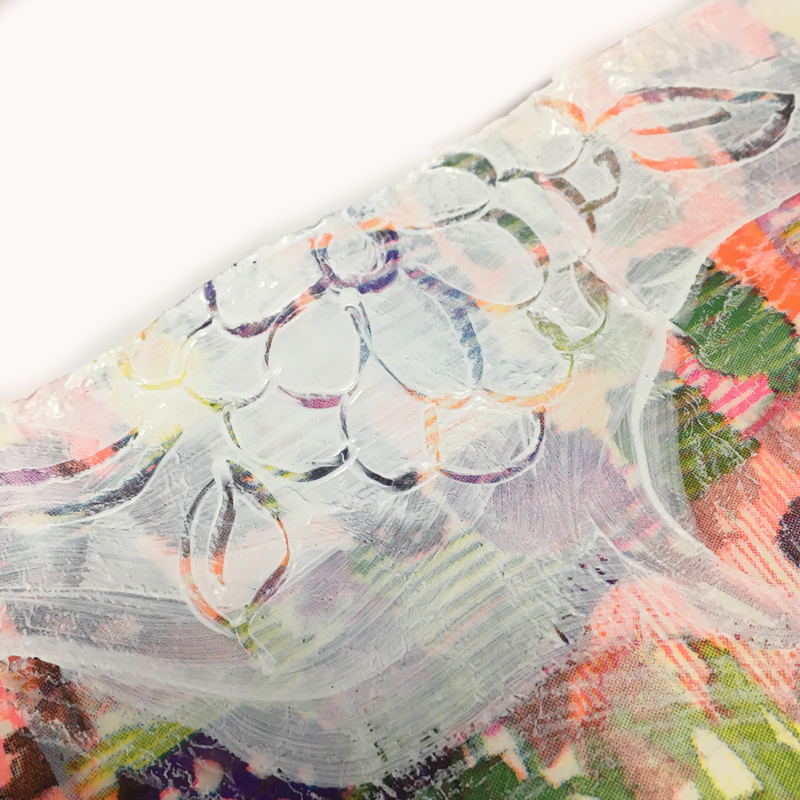 While the gesso is still wet, use an implement to scratch designs into the wet paint – this technique is called sgraffito. Time to add some color to the face, I used Aquapastels to add the base colour and they dissolved beautifully. 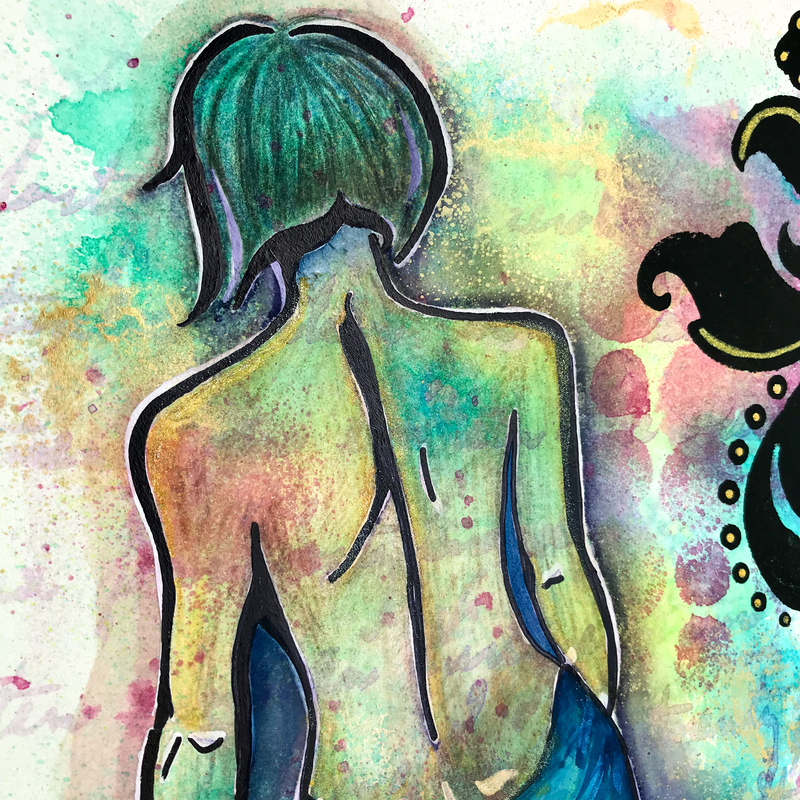 Outline all the main elements using paint in a fine line bottle – this adds a little boldness to the image and helps to separate the image from the background and make it stand out against the very bold colors. 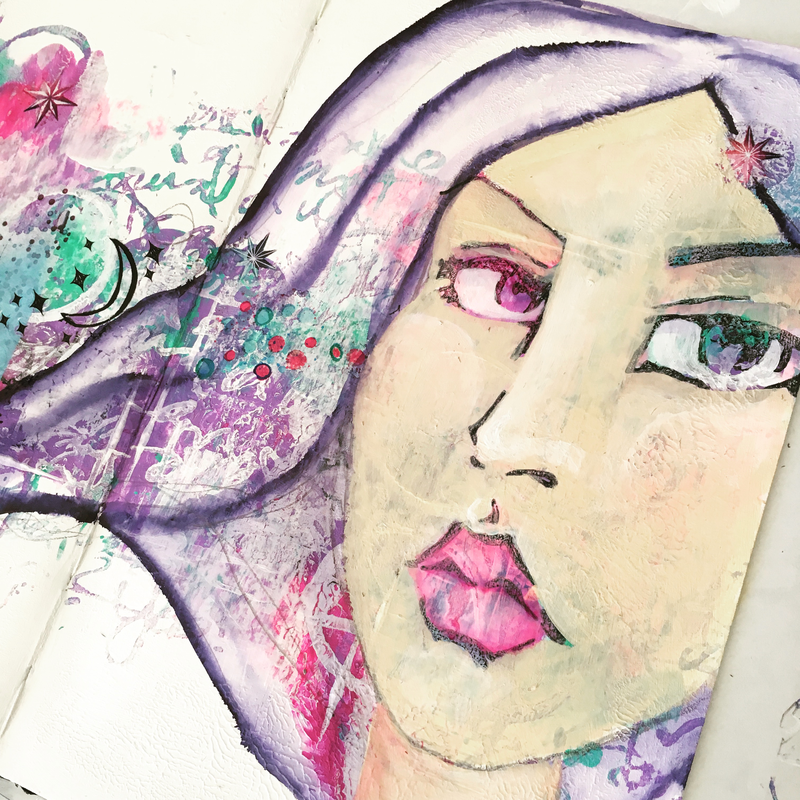 Add final details to the image using White Sharpie paint pen and Inktense pencils. The combination of pencil for details and white paint to add some lightness finishes off the image. 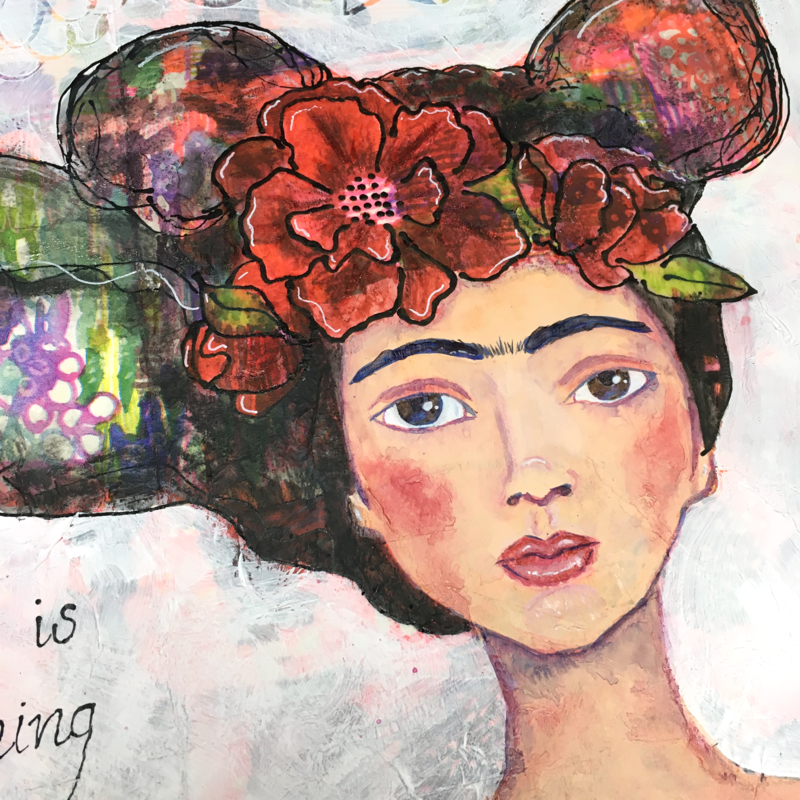 And the finished page is a riot of colour – worthy I hope of Frida. Now there is no way to capture the layers and process in words alone, so I’ve filmed the process of creating this page so you can all watch and play along! I hope you’ve found a few new ideas in this page that you might like to try for yourself! 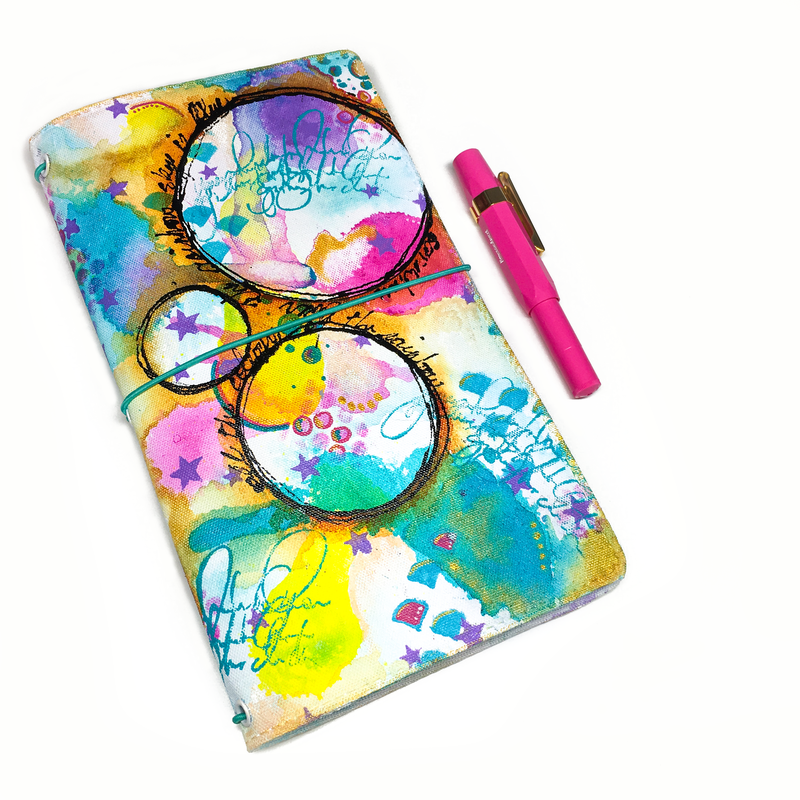 Today we are going to check out 5 simple techniques for decorating notebook covers. So why do you need special techniques for notebook covers? Well most of us are actually using the notebook, so the cover needs to be sturdy, and easy to slip into a bag or a bookshelf with other items. If you have 3d flowers or embellishments that protrude too far these can become ripped off, snagged, damaged or at worst damage other items! So it’s best to keep working notebook covers as flat as possible! 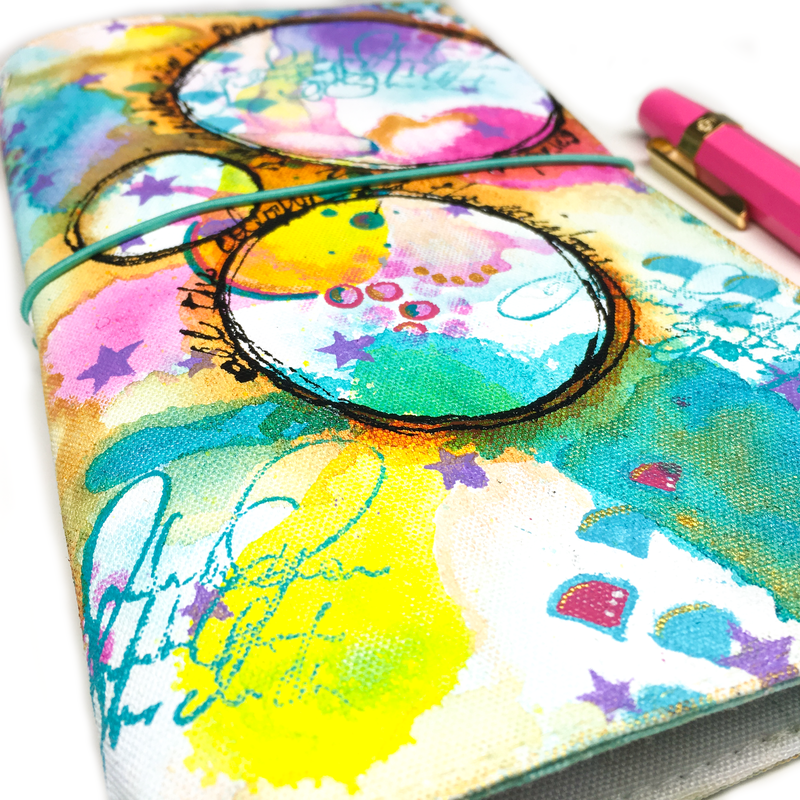 Ah, so many choices when looking at how to add colour to a journal or notebook cover – the options are mind boggling! But no matter what you decide to use, priming your cover with a nice even coat of gesso is a must – white gesso if you are planning to use pastels or want bright colours or black gesso if you are going to be a little more adventurous! 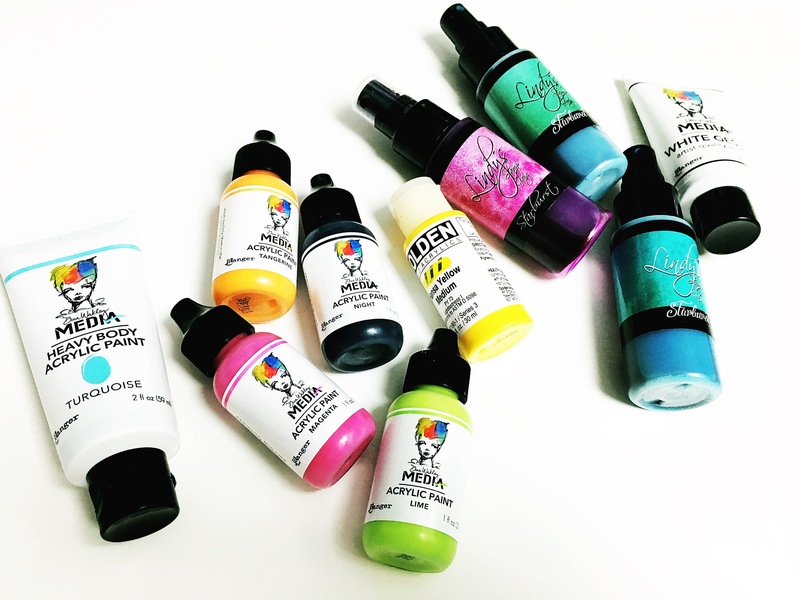 My favourite and most trusted options when working over gesso are acrylic paints, sprays, and inks as each work beautifully for adding colour – though they do have slightly different properties and looks. Acrylics enable you to control the opacity (how see through something is) by using as it or diluted with water. 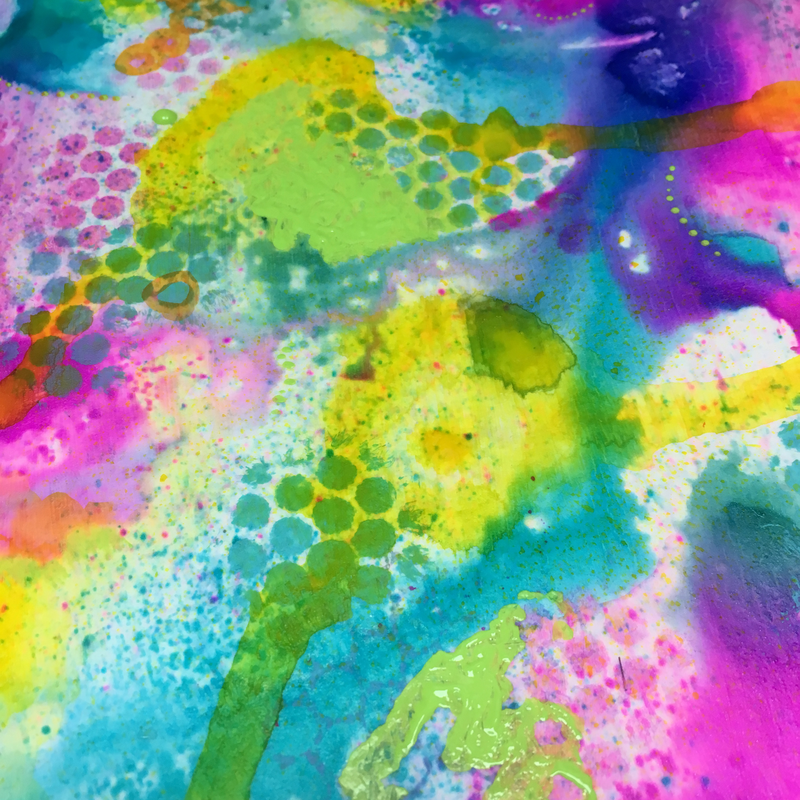 Acrylic paint can be painted direct from the tube for maximum opacity, but it can also be spritzed with water to encourage the colour to spread. 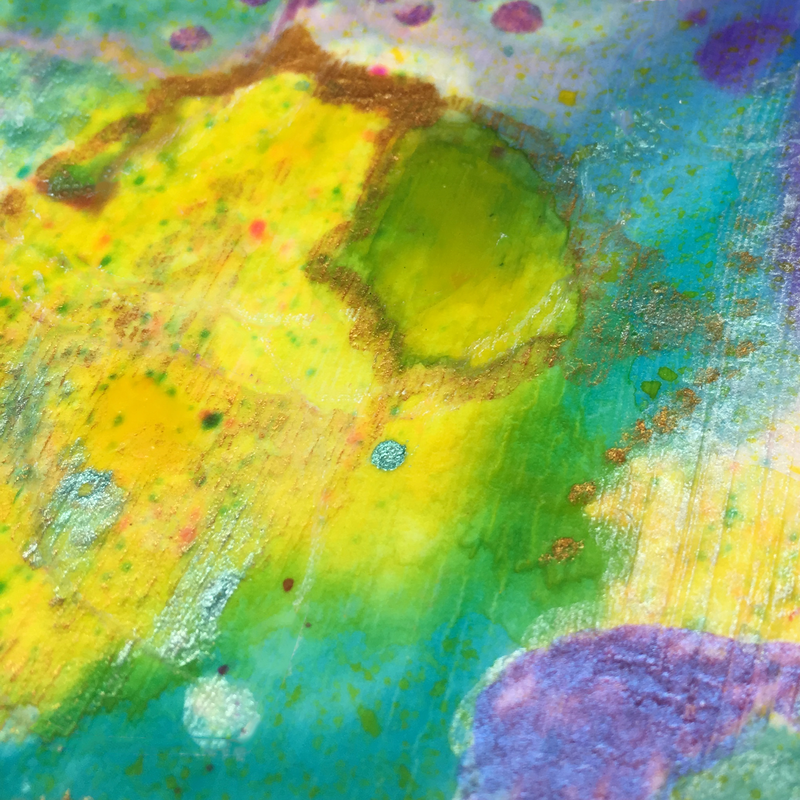 It may spread a little or a lot depending on the thickness of the paint and the brand eg: Fluid acrylics spread easily when sprayed with water and Jane Davenport Acrylics require a little more encouragement. 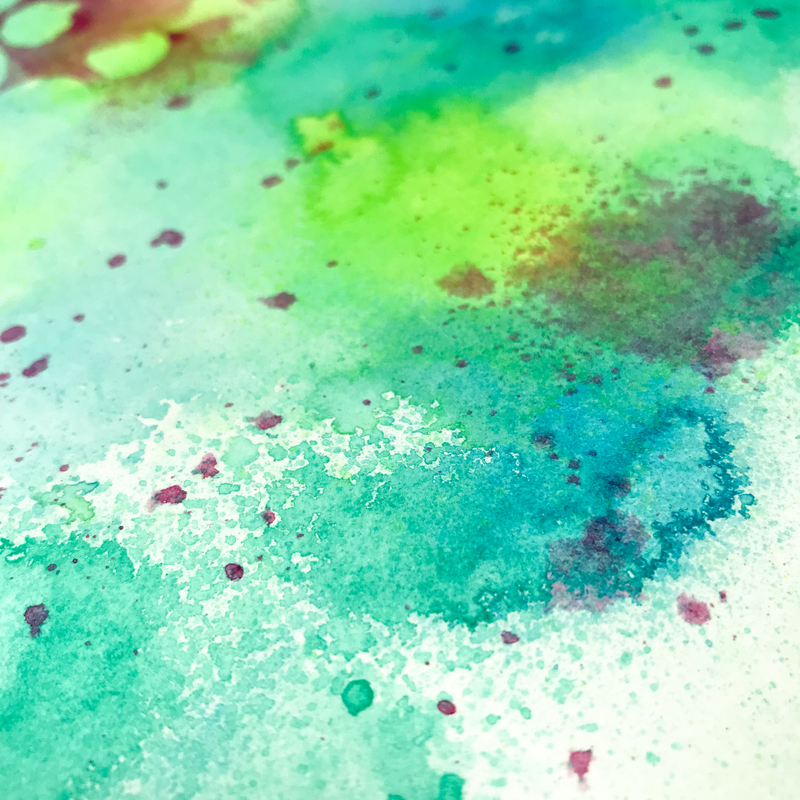 Inks by definition are thinner, usually more transparent and can be added straight from the bottle and will spread and drip easily, or add water for a more watercolour like look. 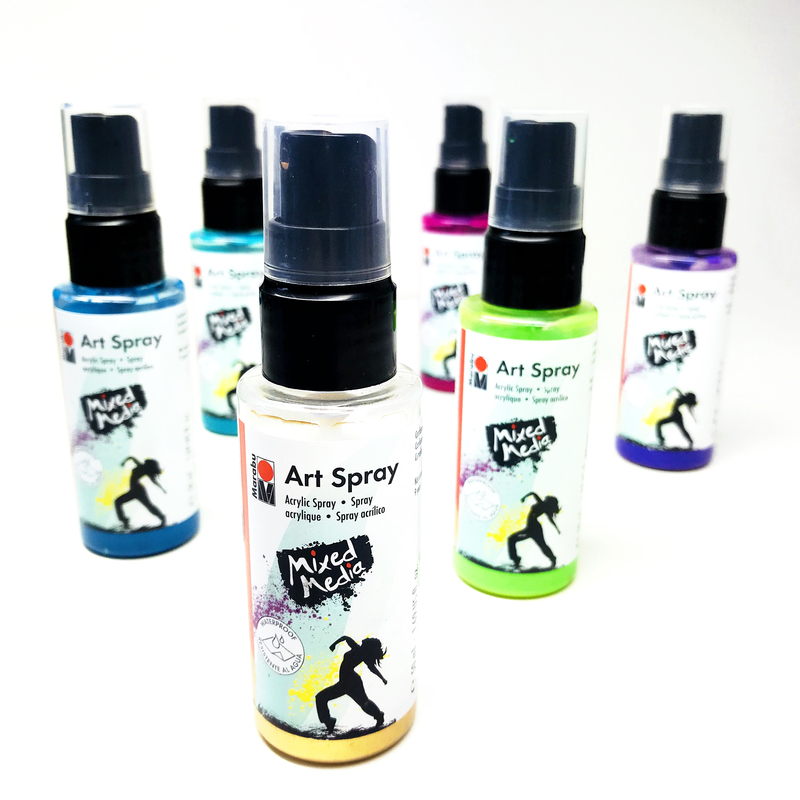 Sprays – well we all know these spread, run, drip and blend – spritz away – many are transparent (though check first as there are a few opaque sprays on the market) and often they don’t even need to be spritzed with water to spread and wick out! Flat design elements are a must on working notebook or journal covers! 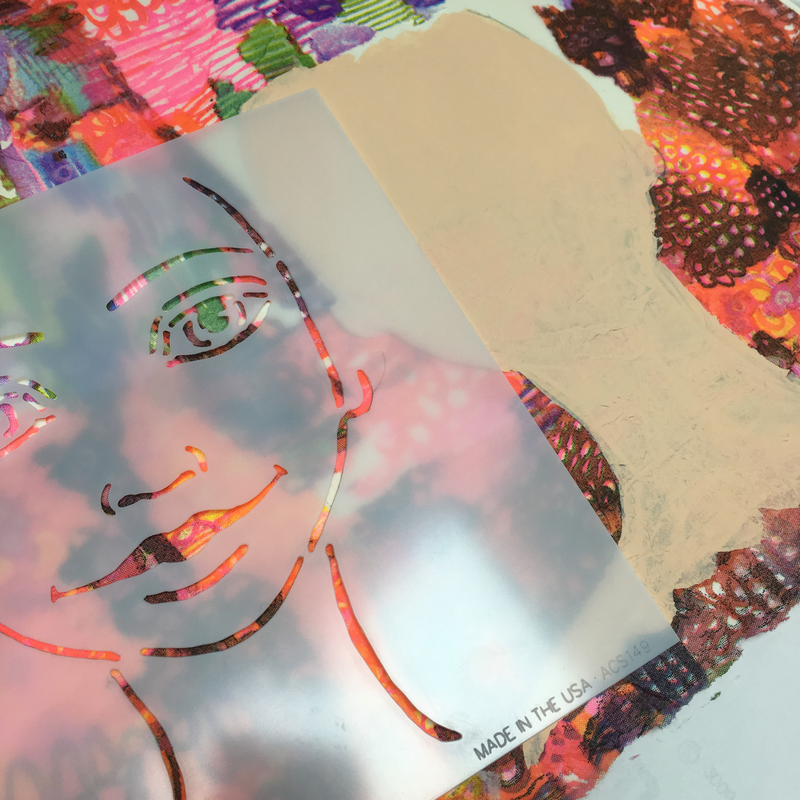 Some of the amazing ways I have found to add flat design elements are to use punchinella, stencils and masks, writing with paint (either with paint pens or paint in a fine tipped bottle), stamping, foil and embossing powder. All of these things can add interest to your flat design without adding bulk or creating issues later. 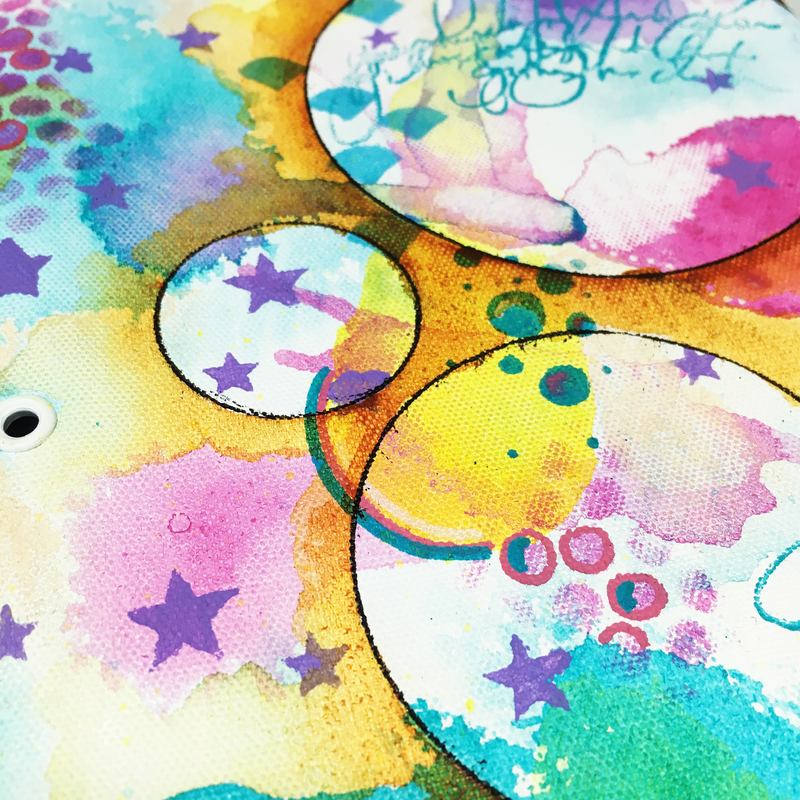 So let’s get to those 5 Fabulous Techniques for Decorating Notebook covers…..
Ultra fun and ultra messy, this technique is addictive, unpredictable, colourful and perfect for backgrounds! The only trick is not to cover your whole background – leave a little white space (I struggle with this as I want to add more and more pretty colours!). Basically, add little dots of paint and spritz with water. Just do one colour at a time to keep it crisp and clean or add multiple colours for colour blending. Let the color spread, drip and run until you are happy with how it looks. This really had to be here, whether you are adding delicate designs of creating bold marks there will be a perfect stencil out there for you! Some of my favourite stencils are from Donna Downey, The Artist Cellar, The Crafter’s Workshop and Stencil Girl. But there are also so many other amazing brands and companies out there! To keep this specific cover looking bright and clean I used a different paint colour for each different stencil design. 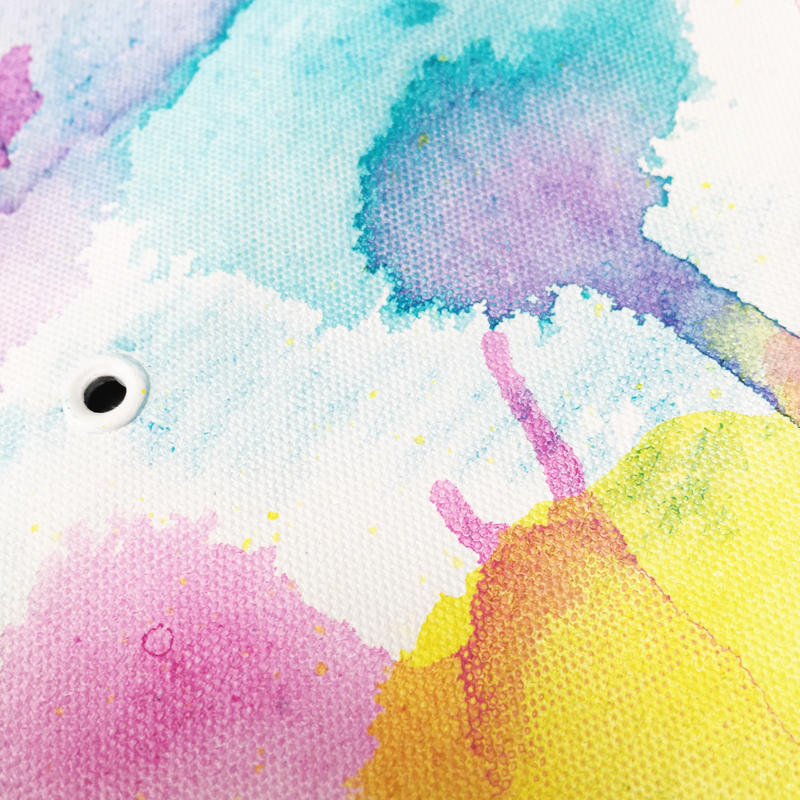 This is fun and works really well on canvas notebook covers! Make sure you are using a stamp with nice thick, bold lines or designs as anything too fine or detailed will end up looking like a blob. Text, geometric shapes, leaves etc all work really well when stamping with paint. This adds a touch of imperfection and a little unpredictability to your cover. 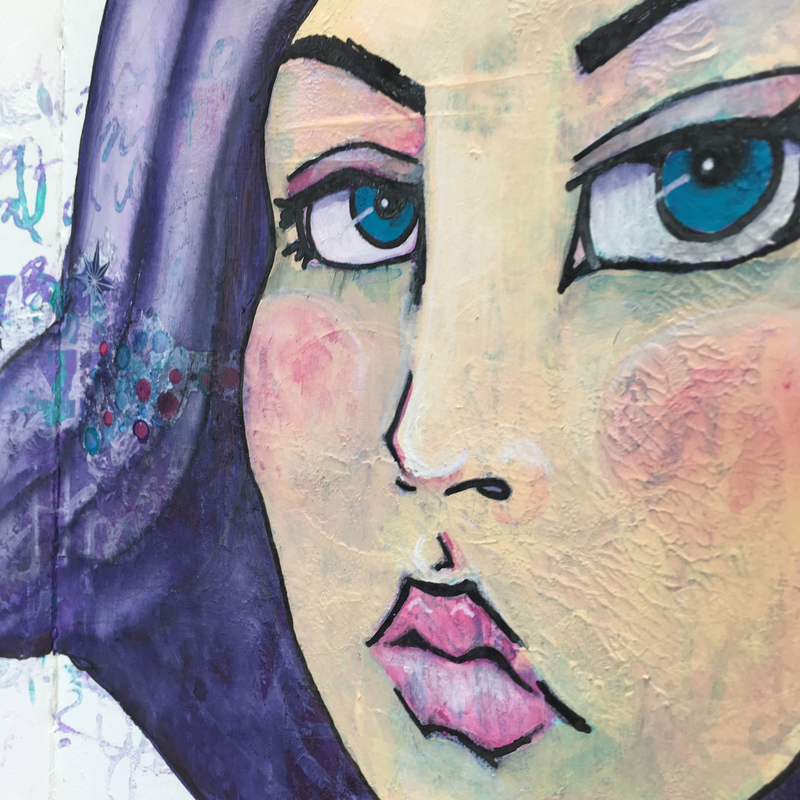 It can also be incredibly scary and go wrong really fast, so make sure you have practised on a piece of scrap paper first before you begin working on your actual cover. 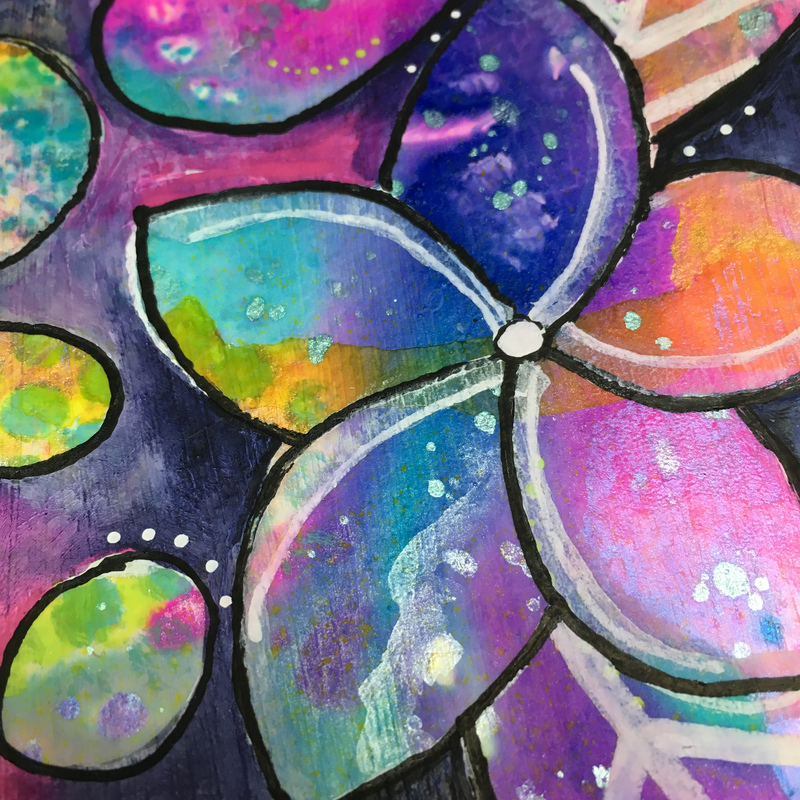 Using either paint pens or thinned down paint in a fine tip applicator bottle, be brave and add doodles, patterns, designs or even handwriting. This last step may just be the most important! This finishing touch can make all the difference to the overall look and ‘togetherness’ of your cover, it really is amazing how important this last step can be. 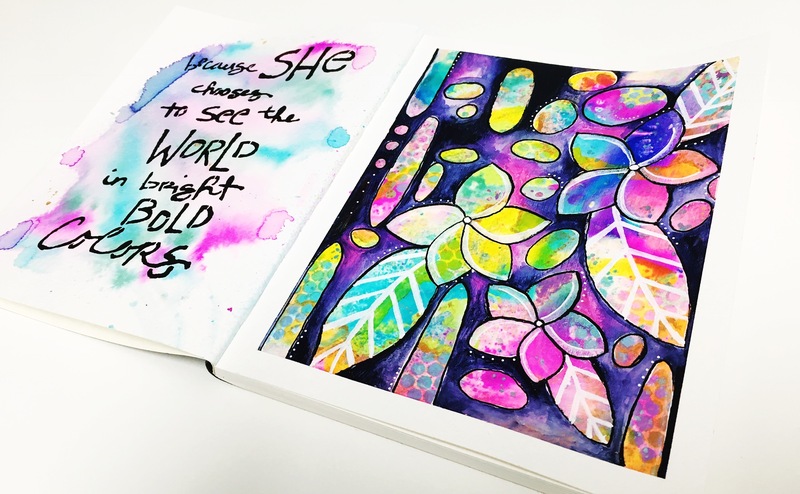 In this case, it adds a little shimmer and shine to the cover and the shimmer of the metallic helps to enhance the other colours on the journal cover. and how does the finished cover look???? Like a rainbow at my fingertips! I’ve also filmed the whole process so you can play along and create your own version! I hope you’ve enjoyed these ideas, and have fun decorating some of your notebooks. Hello there Lulu Art fans, it’s Kate here with you today and I’m being brave and stepping out of my comfort zone a little to share a bold and vibrant page inspired by the art of Tracy Verdugo. 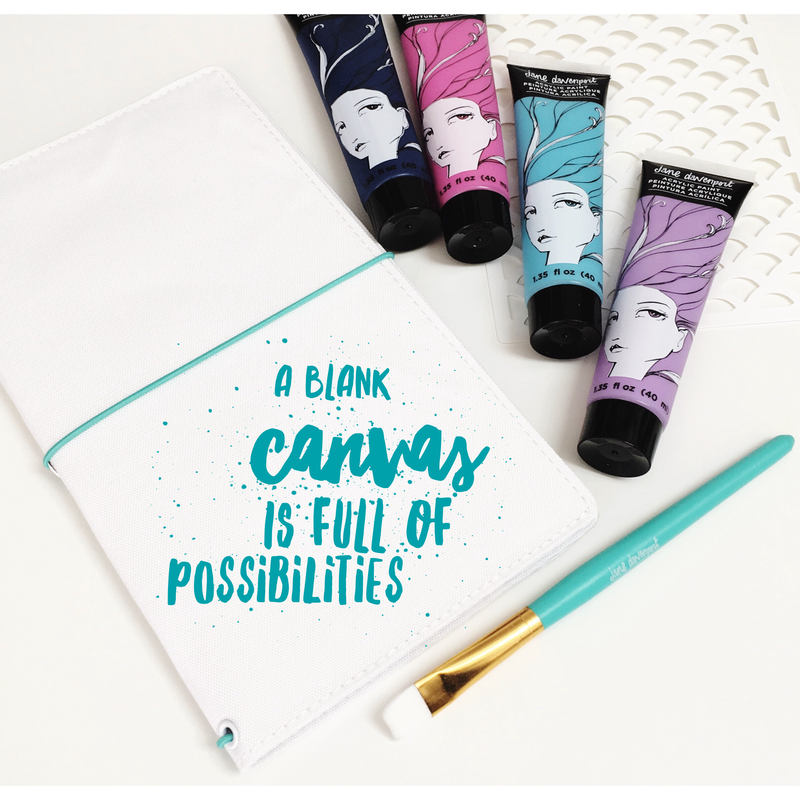 My art journal spread was created using an array of my favourite products from sprays to paints – from the Lulu Art online store of course! The basic idea for this page is lots of layers, LOTS of LAYERS, each one different to the last using different products for each one! 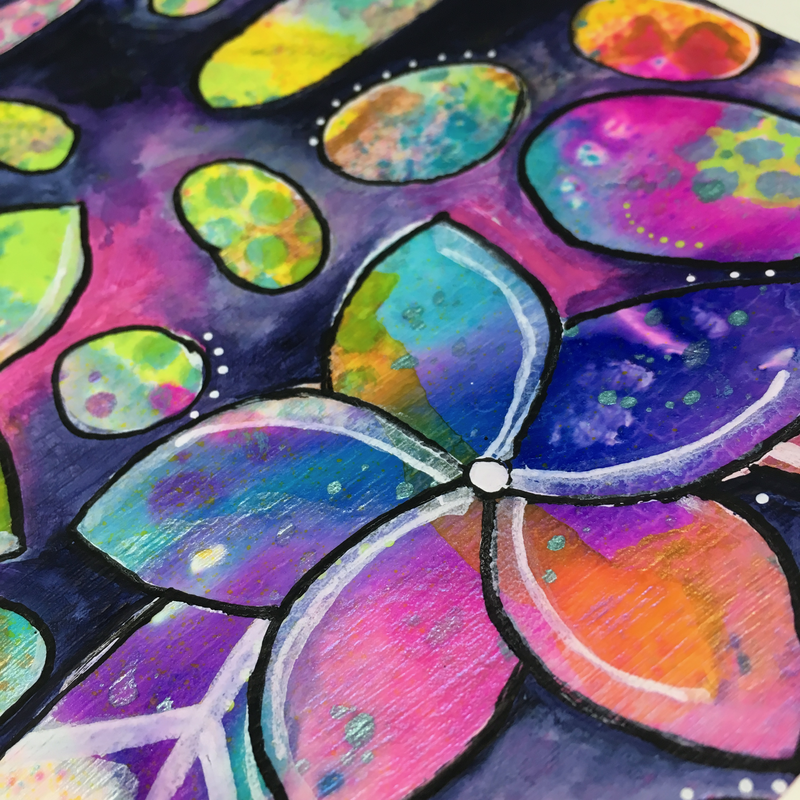 Start by coating your page in gel medium and adding colour using Lindy’s Starburst Sprays while the Gel is still wet. 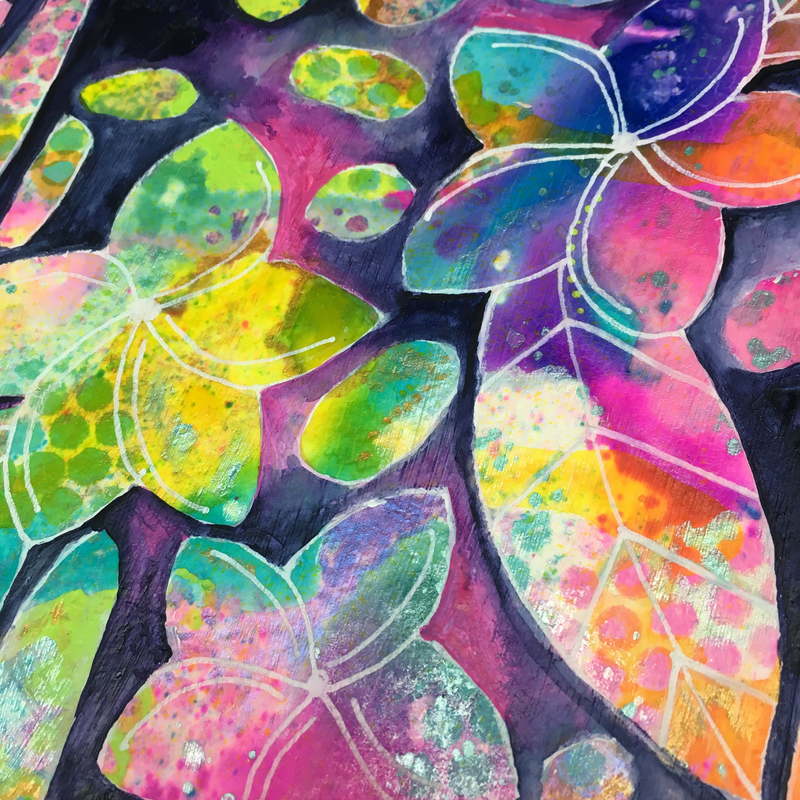 Once dry, use a water brush to add in a little Dina Wakley acrylic paint in several colours, drying between ‘unfriendly’ colours eg: green and orange, also stipple on a little paint through some Punchinella for extra interest. Then add some extra shimmer by adding glazes and small designs with Metallic Accents paints, vary how thickly you add this. 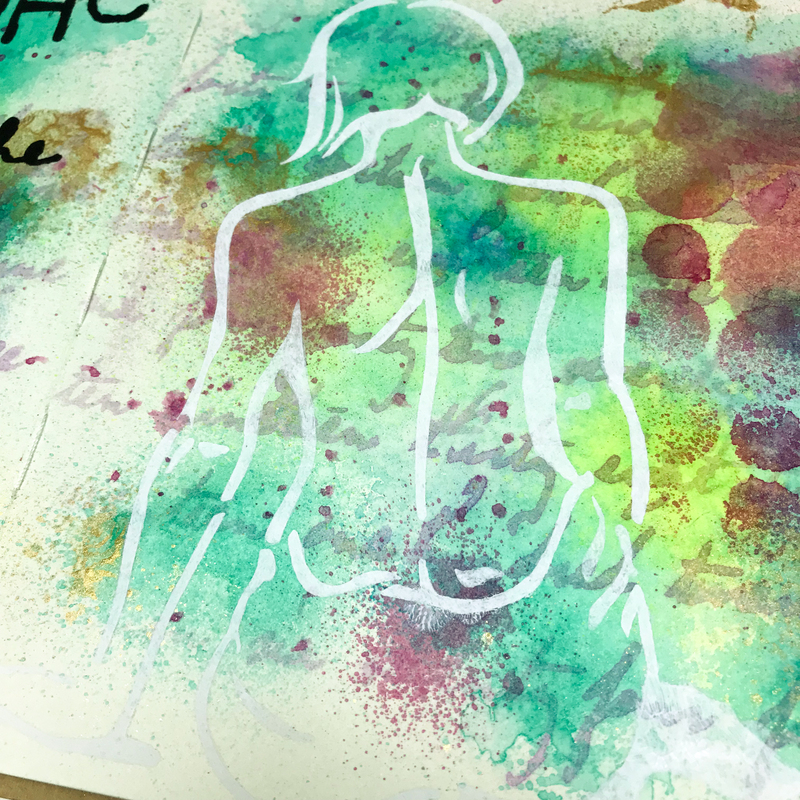 Spray the facing page with water and spritz and flick on some of the same colour sprays (Time Travel Teal, Shaby Turbine Teal and Hi Maintenance Magenta), to create a lighter but coordinating background. Keep working on the other page while this dries. You will notice a huge difference as to how these behave and look, when applying over gel medium vs wet paper. 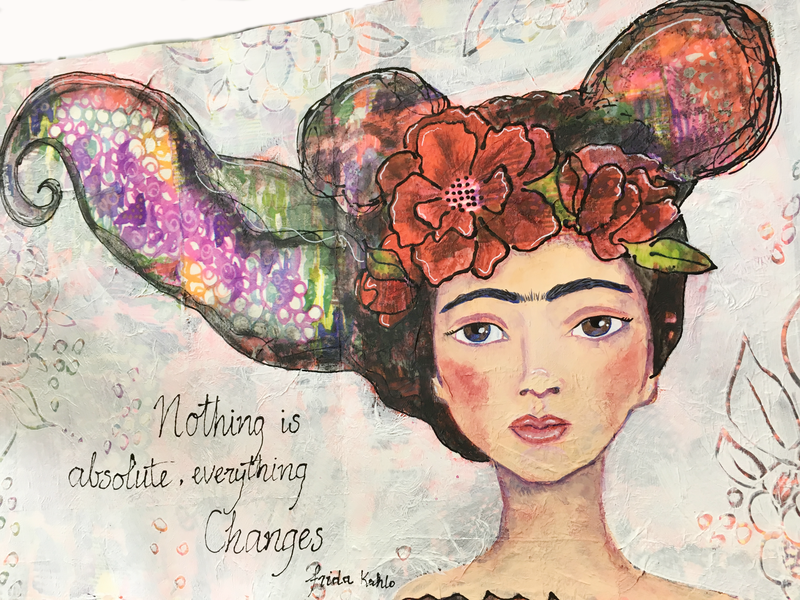 Using a pencil or chalk, lightly sketch designs onto your painted page, make sure you include the best bits with the most interesting colours and patterns into your designs. Then use a fine tip white paint marker to trace over your design. 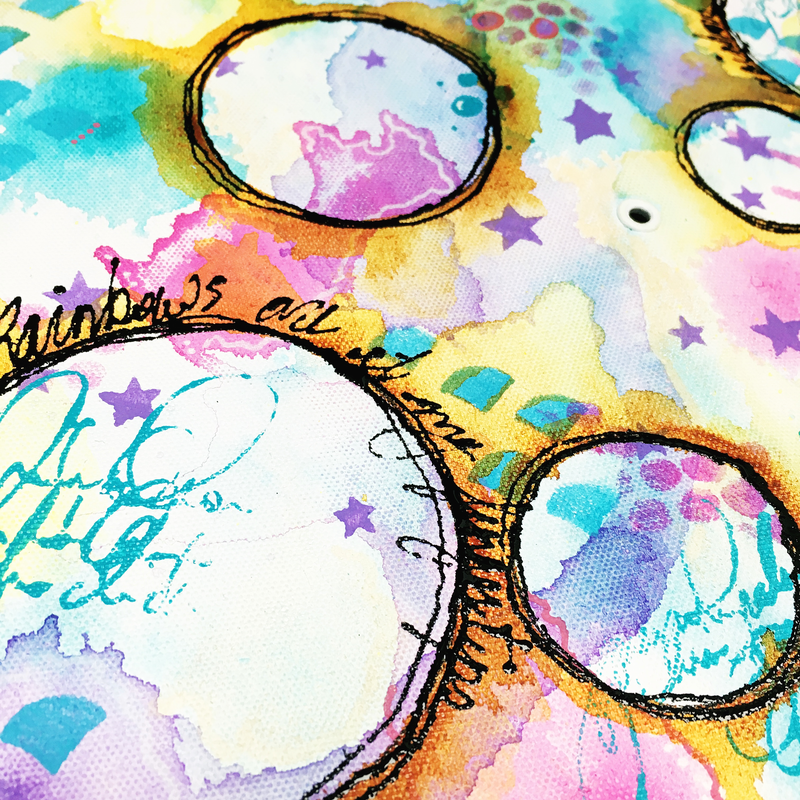 Fill in the areas between your drawings with white Gesso and dark colour acrylic paint (I used Night from Dina Wakley). You can also add in another colour if you like – I used Magenta. Mix and blend the colours for more interest to your background. Add more white for a pale background and more of the darker colours for a bolder background – both look amazing. 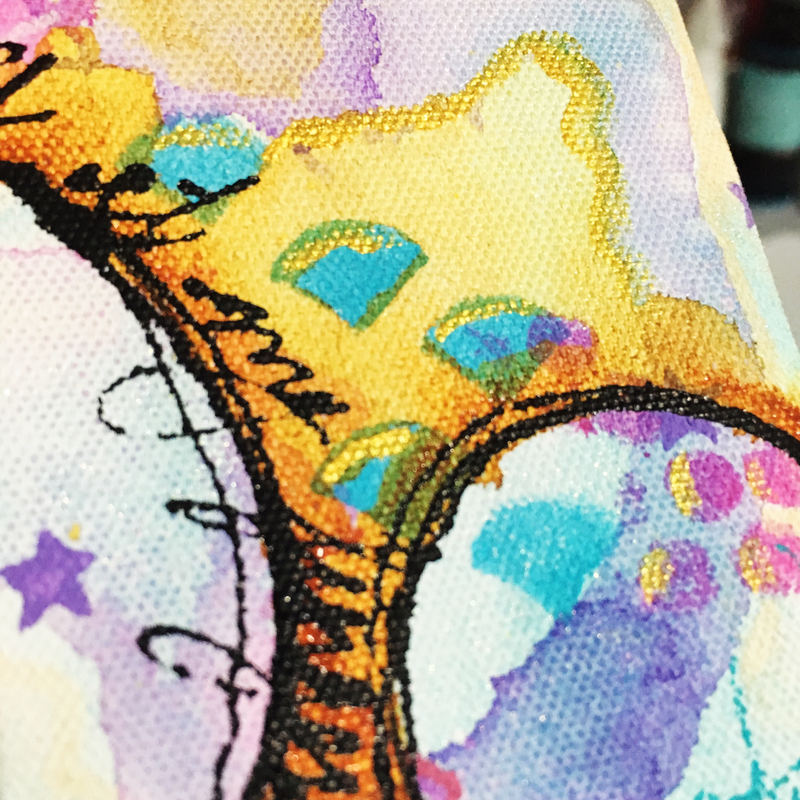 Outline and embellish your designs using fine detail paint pens in both black and white to make your designs really POP. 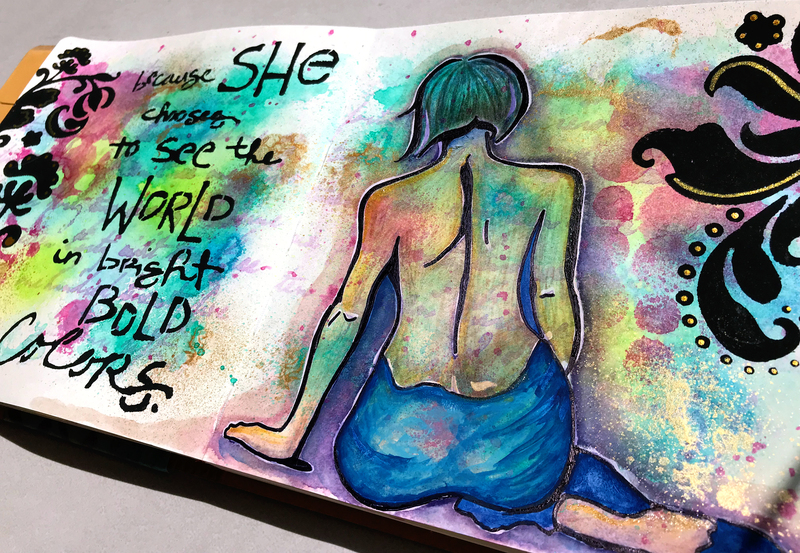 Using black gesso and a bold quote stencil – this one is from Donna Downey, add a quote to the facing page to finish your journal spread.